We use modern internet marketing tools to generate tens of thousands of call leads monthly throughout all 50 states. 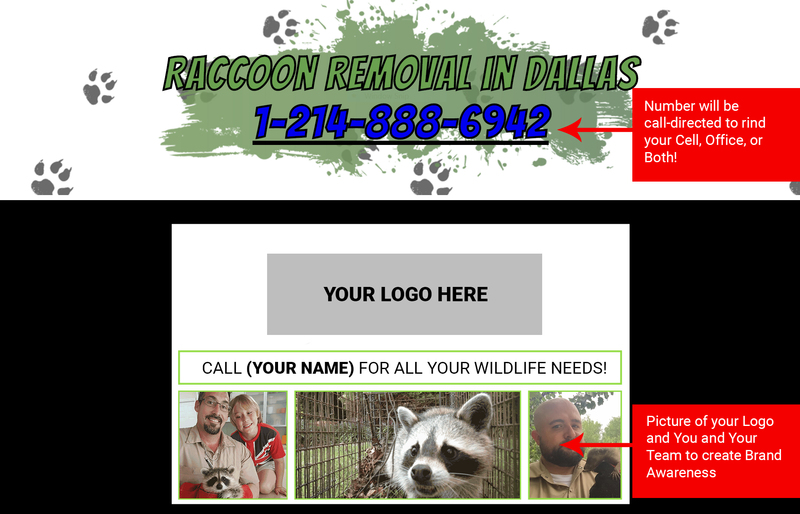 Then we direct those leads toPest & Wildlife Removal companies like yours, you write the service, and you bill the customer. 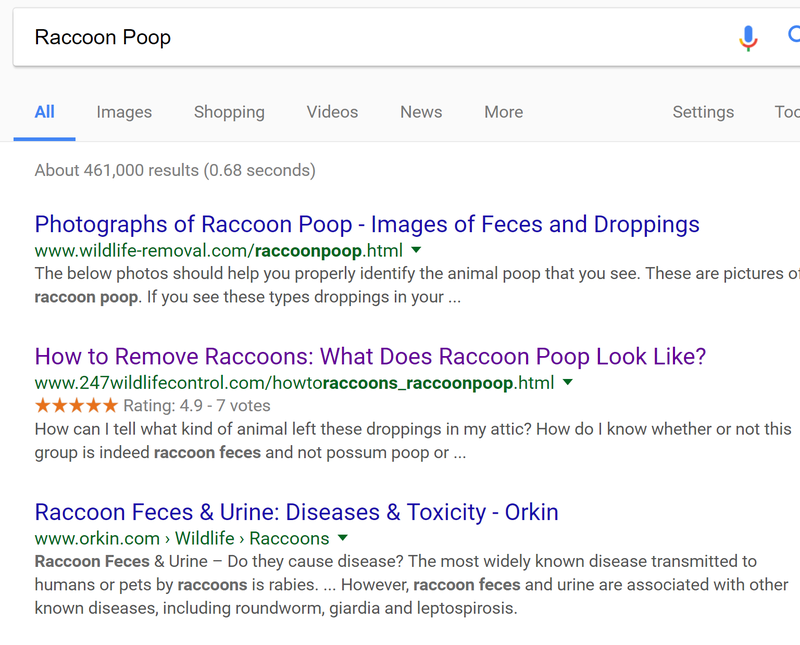 They either research common problems, such as "rats removal," "raccoon poop," or "animals in attic," or they try to get in contact with a local company to help them solve their problem. Their business is directed to you based on location and common search criteria. Our marketing mediums don't have our logos, or branding anywhere–it's your site, found organically. Your referral page will have an overview of your business (list of services offered, technicians names, certifications, or any other important information), and a few photos you wish to display on the page. The customer is also given a local, virtual telephone number that routes directly to your office. All calls through that number are tracked to help you make the most of your sales leads, and you can check these reports 24/7. We bill per lead call taken through our virtual number, exluding duplicate calls from the same number. We don't bill if your business doesn't receive calls through our service. Invoicing options vary by region and call volume– Contact us today for rates and availability in your area. Why Partner With Us For Leads? Unlike other aggregate lead-generating Web services out there, we don't charge per click, because pay-per-click advertising provides less viable leads than phone leads. Our service is designed to guaranteed you the opportunity to engage your customer for each lead you are paying for. For the average-sized Wildlife Company, building a Web site may not be a fiscal possibility. In order to stay competitive in this industry, companies like yours need to have a presence on the Web, and be searchable. For the average-sized Wildlife Company, building a Web site may not be a fiscal possibility. There are thousands of Web sites, and even more searches being done every day for services your company provides. Here is an example of a client's cost to maintain a Web site. It can be extremely expensive to maintain a single wildlife website, and monitor how many different keywords are used. We run a very complex algorithm to make sure our services say at the top of search results. To do this on your own would cost almost $53,000 a month in Google Adwords. That’s not guaranteed sales for you, that’s just to stay visible! There’s not going to be a lot of fine print here. We believe in keeping it simple. We don’t charge a monthly subscription fee. And there are no hidden fees or charges. Initially when you join our team, we will collect personal information from you such as photos,contact info, address, and really whatever information you want on your listing (such as hours of operation, technicians names, etc).We will then get you listed in the areas you serve, you will provide us area codes of where you would like to be available to be contacted for. We will then get you listed in the areas you serve, you will provide us area codes of where you would like to be available to be contacted for. As previously mentioned, there is no monthly service fee, if you somehow manage to take zero referral leads from us during a month (has never happened before), then you owe us nothing. If you take 100 calls (answered or unanswered by you) you owe us the rate per call, multiplied by 100. Like I said, Its pretty straight forward, you just pay for the call, how easy is that!!?? For more information and exact call pricing just give us a call to set up your initial FREE consultation. Thank you, and we look forward to a long lasting, prosperous relationship!